While wet felting wool fibers has been around for thousands of years, needle-felting as an art form is mere decades old. In this class, both techniques will be employed to create solid three-dimensional objects with an emphasis on form and color. Using wire, found objects and wool itself as armature, students interested in creating dynamic sculpture will explore their own designs. Wool varieties, tools, surface design and finishing techniques will be covered. Needle-felters wanting to try wet-felting or vice versa are encouraged to attend though all skill levels are welcome. Note: Both techniques require repetitive arm & hand motion. 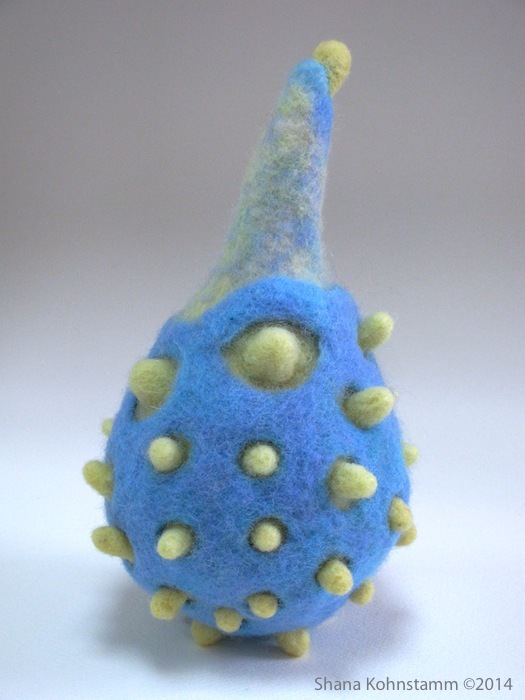 I'm so pleased to be offering these 4 hour beginner's felting classes at Art & Soul, which is located in the heart of the hopping 12th South neighborhood of Nashville. Since this is my first time teaching at this venue, the classes are listed at an introductory rate of only $60 for non-members ($50 for members) and that includes supplies for the day! Click on the links above for further description and registration.